SpaceX engineers are gearing up to launch a Dragon cargo ship atop a Falcon 9 rocket Friday for the company's fifth operational space station resupply mission. And if all goes well, the Falcon 9's first stage will attempt to land on a barge stationed off the coast of Jacksonville, Fla., a key milestone in SpaceX founder Elon Musk's drive to lower costs by reusing boosters that otherwise would be discarded in the sea. The Marmac 300, a platform barge listed on McDonough Marine Service's website and modified for use by SpaceX, features a spacious deck measuring 300 feet long and 170 feet wide. The barge, which SpaceX calls an autonomous spaceport drone ship, was seen by reporters over the weekend docked adjacent to the Jacksonville cruise ship terminal. "Reusability is the critical breakthrough needed in rocketry to take things to the next level," Musk said during the MIT AeroAstro Centennial Symposium in October. "We've been able to soft land the rocket booster in the ocean twice so far. Unfortunately, it sort of sat there for several seconds then tipped over and exploded (laughter). It's quite difficult to reuse. It's as tall as a 14-story building. When a 14-story building falls over, it's quite a belly flop! "So what we need to do is be able to either land on a floating platform or ideally boost back to the launch site and land back at the launch site. But before we boost back to the launch site and try to land there, we need to show that we can land with precision over and over again, otherwise something bad could happen." The SpaceX barge would appear to be an ideal offshore landing platform. 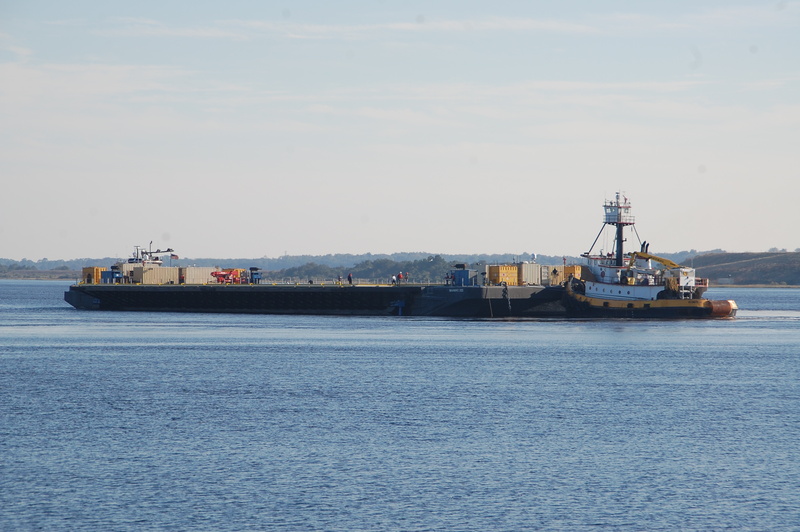 The deck's dimensions are listed as 300 feet by 100 feet on McDonough Marine's website, but the barge was widened by two wing-like additions seen extending from its sides. Company officials did not return a phone call seeking additional information, but the barge is believed to be equipped with powerful thrusters capable of maintaining its position to within a few tens of feet and internal water tanks to help damp out wave action. An industry source said the platform will be operated remotely or autonomously on launch day with a crew stationed on another ship a safe distance away. "For the upcoming launch, I think we've got a chance of landing on a floating landing platform," Musk said at MIT. "We actually have a huge platform that's being constructed at a shipyard in Louisiana right now, which is, well, it's huge, or huge-ish, I mean it's about 300 feet long by 170 feet wide. That looks very tiny from space. The leg-span of the rocket is (70) feet. And this is going to be positioning itself out in the ocean with engines that'll try to keep it in a particular position." The barge will not be anchored and Musk said the sea state and navigation satellite errors will make landing a "tricky" operation. Even so, "we're going to try to land on that on the next flight." "And if we land on that, I think we'll be able to refly that booster," he said. "But it's probably, maybe not more than a 50 percent chance, or less, of landing it on the platform for the first time. But there are ... at least a dozen launches that will occur over the next year, and I think it's quite likely, probably 80-to-90 percent likely, that one of those flights will be able to land and refly. So I think we're quite close." Recovering rocket hardware for refurbishment and reuse is central to Musk's goal of "rapid reusability," a breakthrough he says will dramatically lower launch costs. "In order for humanity to be a space-faring civilization and ultimately be a multi-planet species, it is critically important that we achieve a full and rapid reusability," Musk told "60 Minutes" during a 2012 interview. "If you have rapid and complete reusability for a rocket, then you're really just dealing with the cost of the the fuel and oxygen and that kind of thing. "Look at something like Falcon 9, which cost about $60 million," he said. "The cost of the fuel and oxygen and so forth is only about $200,000. So that's a massive difference. If we could have full and rapid reusability, you could have that rocket flight that cost $60 million maybe cost only half a million, or even less." Joan Johnson-Freese, a noted author and professor of national security affairs at the U.S. Naval War College, said "being able to do a soft landing recovery of rocket boosters saves launch companies time -- and time is money." "A soft landing recovery in theory means you could reuse it quickly," she said by email Tuesday. "If commercial spaceflight is ever going to be anything like a 'normal' industry, fast turnaround and (relatively) low costs are imperative. Airplanes land ready to use again -- not requiring months of hanger time between flights. The analogy with recoverable rocket boosters isn't perfect, but it's close." If all goes well, SpaceX will launch the latest Falcon 9 and Dragon cargo ship from pad 40 at the Cape Canaveral Air Force Station at 1:22:12 p.m. EST (GMT-5) Friday, roughly the moment Earth's rotation carries the launch site into the plane of the station's orbit. Forecasters are predicting an 80 percent chance of good weather, decreasing to 70 percent "go" on Saturday if the flight is delayed for some reason. It will be the first launch of a U.S. space station resupply mission since an Orbital Sciences Antares rocket exploded seconds after liftoff Oct. 28, destroying a station-bound Cygnus cargo craft. As usual with station launches from the East Coast, the Falcon 9 will take off along a northeasterly trajectory with the first stage's nine SpaceX Merlin 1D engines firing for about two minutes and 40 seconds to boost the Dragon capsule and Falcon 9 second stage out of the dense lower atmosphere. After engine shutdown, the first stage will fall away and the second stage will continue the push toward orbit, releasing the Dragon to fly on its own about 10 minutes after launch. The first stage, meanwhile, will attempt a powered descent to the barge some 200 miles east of Jacksonville, extending four landing legs a few moments before touchdown. "Returning anything from space is a challenge, but returning a Falcon 9 first stage for a precision landing presents a number of additional hurdles," SpaceX said in a blog post Tuesday evening. "At 14 stories tall and traveling upwards of 1300 m/s (meters per second, or 2,900 mph), stabilizing the Falcon 9 first stage for re-entry is like trying to balance a rubber broomstick on your hand in the middle of a wind storm. "To help stabilize the stage and to reduce its speed, SpaceX relights the engines for a series of three burns. The first burn -- the boostback burn -- adjusts the impact point of the vehicle and is followed by the supersonic retro propulsion burn that, along with the drag of the atmosphere, slows the vehicle's speed from 1300 m/s to about 250 m/s (560 mph). The final burn is the landing burn, during which the legs deploy and the vehicle's speed is further reduced to around 2 m/s (4.5 mph)." A key upgrade to the Falcon 9 first stage was the addition of four deployable fins mounted in an "X-wing configuration" around the upper part of the booster. The fins can be repositioned independently in flight to help control the rocket's lift and orientation. The use of the fins, in combination with steering by the first stage engines, "will allow for precision landing -- first on the autonomous spaceport drone ship, and eventually on land," the company said. Assuming a successful touchdown, SpaceX engineers standing by on a nearby support ship will move in to secure the rocket's landing legs, locking the booster in place for the slow haul back to port. An industry source said residual liquid oxygen propellant likely will be allowed to boil off and vent overboard while left-over RP-1 kerosene fuel presumably will remain on board. SpaceX has not provided any details about recovery and "safing" operations. While a successful landing would mark a major milestone for Musk and SpaceX, the first priority is putting the Dragon cargo ship on course for a rendezvous with the International Space Station early Sunday. This will be SpaceX's fifth operational resupply mission under a $1.6 billion contract with NASA that calls for 12 flights and delivery of some 40,000 pounds of hardware and supplies. Assuming a launch Friday, the Dragon cargo ship will fly a complex rendezvous to catch up with the station Sunday around 6 a.m., pulling up to within about 30 feet and then standing by while Expedition 42 commander Barry "Butch" Wilmore, operating the lab's robot arm, locks onto a grapple fixture. Ground controllers then will take over, remotely operating the arm to move the Dragon capsule into position for berthing at the Earth-facing port of the forward Harmony module. Wilmore, assisted by European Space Agency astronaut Samantha Cristoforetti, will operate the common berthing mechanism, driving home motorized bolts to lock the spacecraft in place. The Dragon is loaded with more than 3,700 pounds of cargo in the ship's pressurized hold, along with a 1,000-pound atmospheric research instrument mounted in an unpressurized trunk section accessible by the robot arm. The Cloud Aerosol Transport System, or CATS, instrument will be extracted later and mounted on a platform attached to the Japanese Kibo lab module. Pressurized cargo includes food, clothing and personal items for the station's six-member crew, research equipment and spare parts along with high-priority items intended to replace cargo lost in the Antares launch failure in October.